A Rave in Two Languages! "I freaking loved this book! 9.5/10"
Click through to read the rest (and the Russian translation thereof.) Thanks, Karina! This week's quetsion at Criminal Minds is, "What's on your bookshelf?" I offer up a pic that suggests the answer is, "Uh, pretty much everything." Then I take a peek at three new releases I'm dying to dig into, from the likes of Chad Rohrbacher, Peter Farris, and Owen Laukkanen. Click through and check it out! Upstate New Yorkers: On Sunday, June 10 at 2PM, I'll be appearing at Flights of Fantasy in Albany, New York. I'll be reading (quite possibly a never-before-heard sneak-auditory-peek of THE WRONG GOODBYE), signing books, answering questions, and giving away all kinds of random swag. In addition, the good folks of Flights of Fantasy (with a book-assist from my overlords at Angry Robot) have conspired to give away two copies of DEAD HARVEST! All you have to do is shoot them an email sometime before the event and you'll be entered in the drawing, which will take place at the event itself. What've you got to lose? Details for the contest and appearance can be found here. Hope to see y'all there. 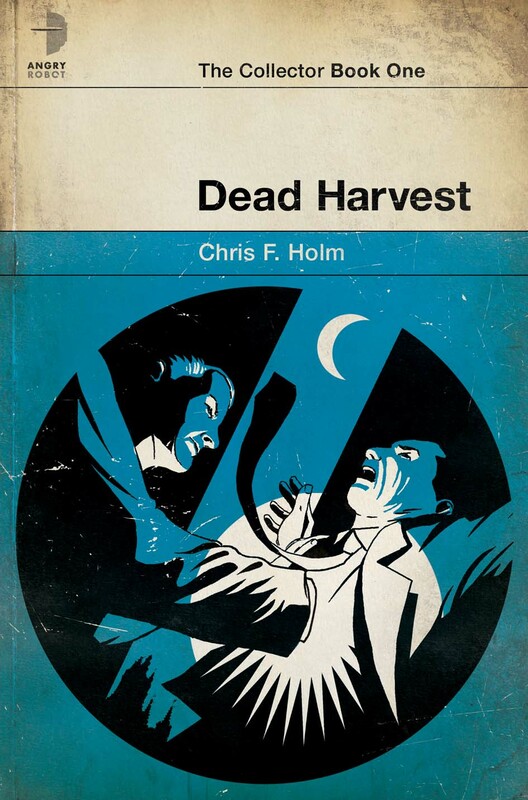 A Review of the DEAD HARVEST Audiobook!
" ...when I came across the book with its clever 1940s cover, I had to get it. Then it was 'strap in, and keep your hands inside the vehicle at all times,' as I devoured this fast-paced, convoluted thrill ride. Vander Ark reads DEAD HARVEST for Brilliance Audio. His voice was a bit too young for the world-weary Sam, but he has a good sense of drama and pacing, and he did a fine job with the other characters; Pinch, Anders and Kate. He gives Lilith a wonderful, sinister purr. Audio book readers should enjoy this interpretation." All in all, a winning review! Though I will say this by way of counterpoint: my mother-in-law was so taken with Brian's gritty, grizzled version of Sam, I think if he were to put out an audio version of the phone book, she'd download it in a heartbeat. So there's that. "DEAD HARVEST by Chris F. Holm, the first book in The Collector series, is completely fresh and absolutely distracting. You won’t be able to put it down... Sam is a flawed and tragic hero who is utterly compelling and strangely sympathetic. The cast of demons and angels surrounding, and often chasing, him are equally intriguing in this solid debut for a thrilling new novelist." "It's hard not to recommend 8 POUNDS. Yeah, the stories are many different genres, but there will be stories that hook you up and leave their mark in your flesh. In my case, there were three which I keep thinking about still, more than one week after reading. 8 POUNDS is a display of power by Chris F. Holm. No matter what he writes about, his storytelling is tight and his prose spare and focused. If there is such a strong parallel to make with Stephen King, it's not because he's a copycat. It's because he's cut from the same mold as the best selling author." 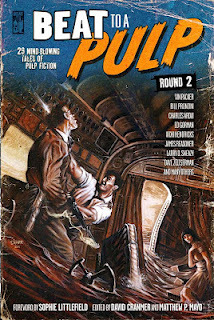 BEAT TO A PULP: ROUND TWO Now Available! You read that right, folks. The long-awaited BEAT TO A PULP: ROUND TWO is now available on CreateSpace, with an Amazon listing (and Kindle ebook edition) soon to follow. BEAT TO A PULP: ROUND TWO features a stellar lineup of talent, including Charles Ardai, Bill Pronzini, James Reasoner, Glenn Gray, Patti Abbott, and many more. It also includes my ghost story "An Open Door," which is an homage to the wildly entertaining paranormal investigation series Ghost Adventures, as well as a kinda-sorta sequel to my award-winning short story "Seven Days of Rain." So what're you waiting for? Order your copy today! Today, at Dark Wolf's Fantasy Reviews, said Dark Wolf Mihai and I sit down to chat about religion, DEAD HARVEST, and how my first ever short story got me sent to the principal's office. You can read the interview here. Thanks, Mihai, for taking the time! Today's question at Criminal Minds is, "Who is the lovechild of your protagonist and favorite heroine?" My post, a birth announcement of sorts, is here. "...you feel for Sam. As you learn about the choices he made, how he ended up among the damned, you understand that the lines between right and wrong are just as blurred in the next life as they are in this one, that justice is just as imperfect, and that a man, or I guess an ex-man, who still struggles for redemption even after he’s already eternally damned, that’s a hero who’s story is worth reading. If you are an urban fantasy fan, then DEAD HARVEST is sure to be a new favorite. But even if you’re not, I encourage you to give it a shot." Last week, I sat down (virtually) with the lovely, talented, and dulcet-toned Stina Leicht, John Anealio, and Patrick Hester and had a little chat for the latter two's Functional Nerds podcast. We intended to talk writing fantasy-tinged crime. Click through and see how long that lasted before we went off the rails and dove headlong into religion (with a brief digression into the pernicious threat of Communism in barbecue.) Sorry, fellas (and lady.) Also, thanks. It was a blast. I know, I know, it seems this blog's no more than a news feed of late, but Day Job and Night Job leave room for little else. So, excuses made, howsabout we just leap into the brief news-o'-me? First off, I'm pleased to announce my short story "Pretty Little Things" will appear in Ellery Queen's Mystery Magazine. When? I've no idea. That'll be fodder for yet another newsy update. But they sent me a contract and everything, so if it's a prank, it's a darn good one. I couldn't be happier to be returning to the pages of Ellery Queen. It's a bit of a homecoming for me, since they gave me my first ever professional credit, way back in the Dark Ages of '07. Plus, any excuse to interact with EQMM's editor, Janet Hutchings, is a welcome one, indeed. Meeting her this B'con past was a highlight among highlights. And I'm quite fond of this story (which I wrote about a while back here); I think it may contain the best twist I've ever written. "Holm writes in an assured style with engaging prose... an enjoyable read that excels on premise and contextual construction." DEAD HARVEST Audiobook Now Available! So it's official: as of today, the DEAD HARVEST audiobook is now available! You can grab a copy at Amazon, Barnes and Noble, Indiebound, or Audible.com. Or just harass your nearest audiobook purveyor until they stock it. I won't complain. The DEAD HARVEST audiobook is read by Brian Vander Ark, whom a good deal of you may know from his time fronting The Verve Pipe. (C'mon, y'all can admit to singing drunkenly along to "The Freshman" after your buzz soured senior year and you got all maudlin and nostalgic about that lousy breakup three years back. And while we're on the subject, no, her making out with your roommate and failing to return your dubbed copy of Throwing Copper is not almost as traumatic as the song's suicide, so stop whining.) Many thanks to Brian for taking the time, and lending voice to people who, until now, existed only in my head. 5/2 UPDATE: There's a clip up of Brian as Sam Thornton at the Angry Robot mothership. Check it out!